Feeling much much better than I was last week, with help from many stitchy peeps (thanks again!). Started on something new, a pretty traditional looking pattern that I'm using more modern colors on. Now that I've started on it, I wish I'd done it on a dark gray fabric rather than white. Maybe I'll do it again in the future. 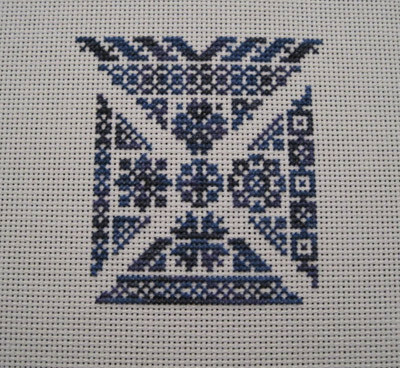 I'm also thinking about doing a bunch of small Christmas/Winter stitches in December. Since I'm not decorating, it doesn't matter if things are done by a certain time. And I've been wanting to make more ornaments for my tree. Figure this is a good opportunity for that. Just have to find some patterns.